Overview: The Mysore Birth Records Cohort is led by Dr K Kumaran, MRC LEU and CSI Holdsworth Memorial Hospital, Mysore, South India. It comprises men and women born in the Holdsworth Memorial Hospital (HMH), Mysore between 1934 and 1966. They were contacted and recruited into the cohort for the first time as adults in 1993. The Mysore research team conducted a house-to-house survey of the city of Mysore immediately surrounding HMH, looking for adults born in the hospital many decades ago. They were then matched to their birth records, which were preserved in the hospital as far back as 1934. Since 1993, the cohort, now aged between 50 and 85 years has taken part in several research studies linking newborn size to later health outcomes. Objective: To study associations between size at birth and adult cardiovascular disease and type 2 diabetes, and cognitive function including age-related cognitive decline. Methods: The cohort is based upon >1,000 men and women originally traced in 1993-2001. A house-to-house survey of a 12 square km area of Mysore City surrounding the Holdsworth Memorial Hospital was carried out, to identify men and women born in the hospital. These were then matched to their birth records, which contain details of their birth weight, length and head circumference, and maternal weight and pelvic diameters. Between 1993 and 2001 the cohort took part in studies of cardiovascular disease (blood pressure, symptoms and ECG signs of coronary heart disease, plasma lipid concentrations) and type 2 diabetes (oral glucose tolerance test). In 1996-1997 they had measurements of left ventricular mass (using echocardiography) and pulse wave velocity (a measure of elasticity/stiffness in the major arteries). In 2003-2004 they were re-studied to estimate the incidence of diabetes. In 2013-2017 they took part in a study of cognitive function and mental health, led by psychiatrist Dr Murali Krishna (the MYNAH study: MYsore study of Natal effects on Ageing and Health). During each of these studies, data have been collected on socio-economic circumstances (SEC), education and occupation, and lifestyle habits, creating a wealth of data across the lifecourse. Future plans in the cohort include a follow-up study of cognitive function and mental health, to study age-related cognitive decline and the incidence of late-life dementia and depression (LINEAGE study). In early studies in this cohort, we showed that lower birth weight was associated with a higher risk of coronary heart disease in adult life. Type 2 diabetes was unrelated to birth weight, but was associated with shorter birth length, higher ponderal index at birth, and higher maternal weight and pelvic diameters; we interpreted these results for diabetes as possibly reflecting effects of maternal diabetes in pregnancy. In the recent MYNAH study the prevalence of dementia and depression was 3% and 19% respectively. Birth weight was positively associated with cognitive scores, independent of cardiometabolic risk markers. Other lifecourse factors related to cognition were (positively) maternal education level and participants’ own education level, adult leg length, body mass index (BMI) and socioeconomic position; and (negatively) age, diabetes in mid-life, a history of stroke, and current depression. There was no association between birth weight and late life depression. Other factors associated with depression were (negatively) being married, current leg length, socioeconomic position, physical activity and haemoglobin, and (positively) Apoε4 genotype, a history of stroke and current homocysteine level (manuscript in preparation). Krishna M, Kumaran K, Veena SR, Krishnaveni GV, Karat SC, Cox V, Coakley PJ, Kiran N, Stein CE, Paul BDR, Prince M, Osmond C, Fall CHD. Cohort Profile: The 1934–1966 Mysore Birth Records Cohort in South India. Int J Epidemiol 2015; 44: 1833-1841. PMID: 26445965. Krishna M, Veena SR, Krishnaveni GV, Kumaran K, Karat SC, Coakley P, Osmond C, Copeland JRM, Varghese M, Chandak G, Bhat D, Prince M, Fall CHD. 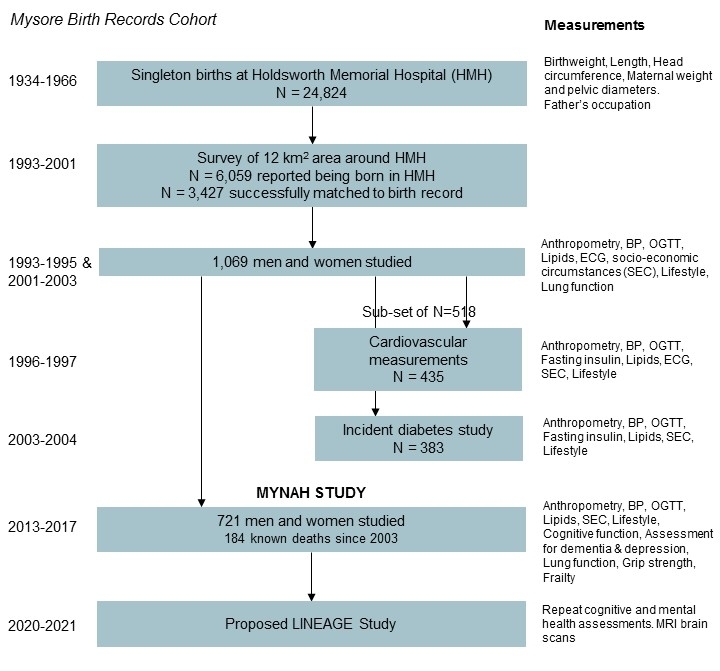 Birth size, risk factors across life and cognition in late life: Protocol of prospective longitudinal follow-up of the MYNAH (MYsore studies of Natal effects on Ageing and Health) cohort. BMJ Open 2017;6:e012552. doi:10.1136/bmjopen-2016-012552. PMID: 28209604.